Step 11 Make sure that your dummy folds and works properly, so that the pops do not catch on one another. 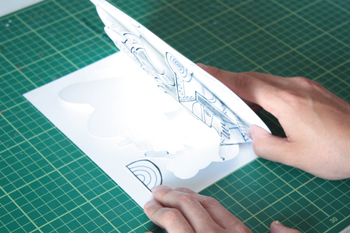 Most traditional pop-up book spreads protect the pops within the dimensions of the page. You may wish to challenge this convention depending on the nature of your artwork, so the artwork spills from the edges of the pages when they are closed. Experiment with the sizes and shapes of your pops to achieve this. Step 12 When your dummy is working the way you want it, it’s time to finish the artwork and re-draw in the gaps that have been left behind. 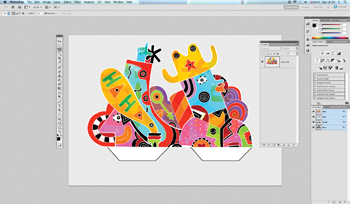 As you are converting 2D artwork into 3D shapes, it is important that the artwork on each pop is complete as you will be able to see through and beyond each pop as it sits on the base. Step 13 Now add the artwork to your base. Drag and drop the artwork onto your base canvas. 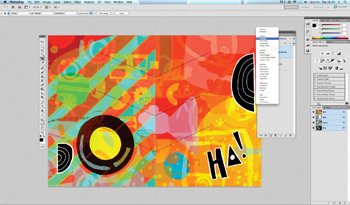 In the Layers panel change the blending mode to Multiply so that your glue points are made visible on the artwork. Print out the base.